Promotional conference folders drive client engagement to your firm or agency, and this functional business merchandise puts your company name directly into the view of your customers. Not only for the office use, printed folders make a great organisation aid you can bring to your events. 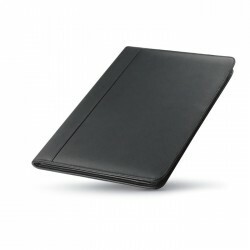 Recipients can also use them as well for keeping their documents and receipts tidy. And each time these folders that bear your company name are used, it will bring increased recognition to your organisation. Make your mark and add your contact details or message on any of our custom folders and file binders. Take a look at what we have to offer and find the one that suits your needs. Printed A4 conference folders neatly store all the documents received during corporate events, like hand outs, flyers and seminar presentation decks. 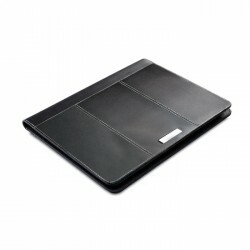 They're great for slipping into a briefcase or rucksack to keep critical information tidy and organised. Choose from a variety of styles and options, including compartments for pens, notepads, loose paper compartments, and a calculator if required. Branded A5 conference folders are a handy size to jot down notes during a seminar, and keep any important small items like conference passes, business cards and other contact details. Sketch out a new business plan, keep a record of important calls, and have everything to hand with these branded conference items. While leather may be a luxury, there's plenty of opportunity to make a brand impact with our budget range of folders and conference material. They're great for large expositions and events, where hundreds or thousands of people will need a handy pocket to store printed material. Executives at any company need to make an impact. Whether in the board room, the corner office, or the hot desk, executive printed folders embossed with your company brand are a visible sign of excellence. Many are hand made from our impact and community driven leather factories in India, and some also include power banks integrated into the lining. Whether it's about our product quality, prices or delivery time, our primary goal is to never let a customer down. With our 4.8/5 score on Feefo, we pride ourselves on excellent customer service anytime, all the time, and always. Our team of dedicated staff will ensure you’re happy and satisfied with your order of printed office folders. For more information about our products and the status of your order, get in touch with us over the phone, email or live chat and any of our customer service support will be happy to answer your questions. We're located in High Wycombe, just west of London and can ship to all destinations in the UK quickly and efficiently. Why wait around for the others? As most of our standard products can be screen printed in just one to five working days, that means less waiting time for you. We will keep you updated on the status of your order so you don’t have to worry about coming empty handed on your marketing events. After successfully placing your order of custom folders giveaway, you can easily and instantly track its status online. Our customer support is always on standby and eager to assist you. With a solid team of experts who have been in the promotions industry for more than 20 years, you can be sure that our helpful representatives will assist you in ensuring you are delighted with your corporate folder souvenir. Always delighted to help, whether it’s about the design, pricing or delivery, we are just a phone call, email or chat away! In making a brand statement, our selection of folders and portfolio is sure a winner at any offices and our online catalogue have so much more in store for you! We have thousands of souvenirs, keepsake, and incentive merchandises that you can customise with your business name and logo. From office supplies, golf accessories, to personal bags, we have it! Start browsing now for the rest of our quality goods at mouth-watering low prices.